A nasty invasive you dont want in your yard. Japanese stiltgrass (Microstegium vimineum) is a nasty invasive plant that is taking over huge tracks of our countryside. It prefers semi shaded and shaded areas so it is has less other plants to deal with and is effortlessly replacing them all as the main woodland undergrowth. For those who dont know its dangers it looks pretty amazing. Walk through a woodland and you see all this lush green grass growing under the trees. The trouble is that is all you will see. There is absolutely nothing else growing there but Japanese stiltgrass. It takes over everything and smothers out all the native plants that should be growing in the woodland. 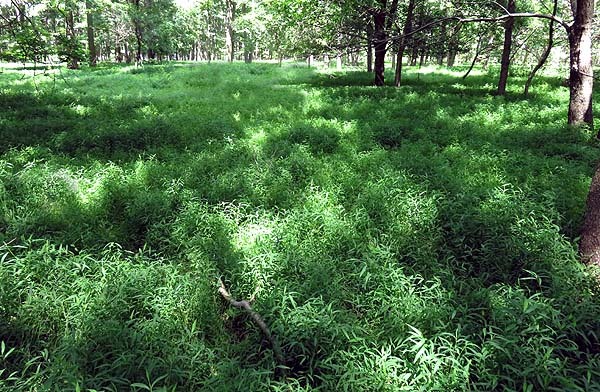 Japanese Stiltgrass has totally taken over this woodland. The other problem is that native animals, mainly deer, dont like to eat stiltgrass. They prefer the native species. So they will wade through the stiltgrass searching out the few remaining pieces of native vegetation and eating that. This is great for the stiltgrass since it ensures that any competition that it might have is removed and it has a free rain to take over without much chance of being eaten. 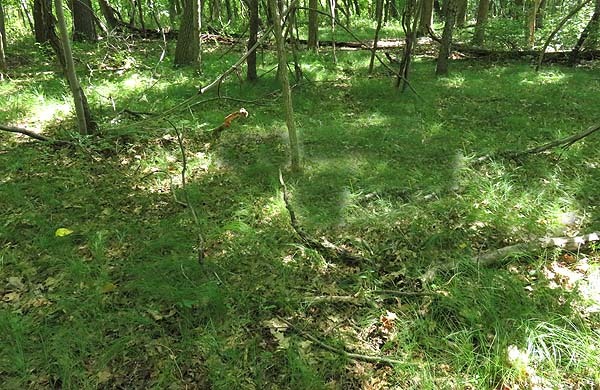 Before long all our woodlands in the northeast will have nothing but stiltgrass as undergrowth. Native grass woodland, what it should look like. Stiltgrass will also invade lawns. This always happens from the shady edges under trees shrubs or at the edge of woodlands. 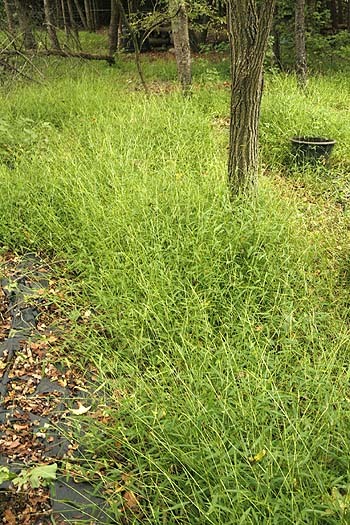 Stiltgrass will begin to encroach on a lawn and can eventually take over these areas entirely. Stiltgrass is rarely a problem in full sun areas as it always prefers the shade. Stiltgrass is semi shaded woodland area. Stiltgrass is an annual plant. Think of it like a really invasive crabgrass. It flowers drops seed and then comes up again next year just like crabgrass. While crabgrass spreads out in a circle stiltgrass spreads by jumping It creates a long stem with a bend like an elbow joint in it. Where the elbow touches the ground new roots sprout and the grass moves across the ground. This is why its called stiltgrass. Left alone stiltgrass will grow to about 3feet in height but can reach 4 or more and produce an airy fluffy look that can be quite attractive. Often homeowners find the grass growing in their woodland areas, think its nice and are often happy that something is growing on the ground there. Its left alone and before long its marching out to take over the lawn, by that time its too late to control it. Like crabgrass stiltgrass produces a lot of seeds, but they are pretty tiny and not as easy to see as crabgrass. One plant can produce as many as thousand seeds in a year. These seeds fall to the ground and can then remain viable there for five or more years. They are also pretty sticky they will attach to shoes, pet fur, and wild animals and are easily transported over fairly long distances to reach new areas to colonize. Seeds are produced around August in zone 7 (New Jersey), but can be earlier or later depending on your location. Once in a good spot they will germinate in the early spring, about the same time as crabgrass. Like crabgrass stiltgrass seeds need light to germinate this is why they do so well in forests where there is usually quite a lot of bare ground during the springtime. It’s also why crabgrass cant do well on a healthy lawn. If the grass blades are close together the seeds can’t get to soil that light falls on and they can’t germinate. Controlling stiltgrass is a lot more of a problem because it tends to come in from the shady parts of the lawn and from under the trees. Lawn grasses tend not to do as well in such areas and the grass is often spotty and there is more bare ground for the stiltgrass to germinate on. Once it takes hold it will smother out other grasses. Mowing the stiltgrass down only makes it strong and forces it to flower at a much shorter height. It does not remove the problem. Its most likely going to be a never ending problem. Once you have a woodland area that is prone to stiltgrass unless you can find a ground cover for your woodland, then its going to get more stiltgrass coming in. If you live next to or near a wild area that has a stiltgrass infestation then you will most likely be battling stiltgrass forever. There is no known way to eradicate it. There are however several techniques you can use to keep it out of your garden. 1. 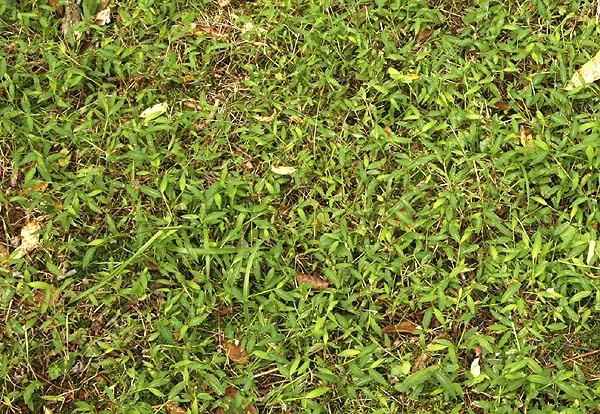 A pre emergent crabgrass killer can be applied to stop the seeds from germinating. The problem with this method is that nothing else will germinate either. If you are intending to plant the area with more mature plants or plug plants this method may work well. It will take some time and the pre emergent may have to be applied for several years to ensure that all the seeds are inhibited. It is also important that the area around is monitored if there is stiltgrass close to your location then it will re-infect the area constantly unless the ground is well covered with vegetation. 2. Hand pulling. Allow the stiltgrass to grow to a reasonable height then go through and hand pull. It is important that this be done before the plant has set seed. This method will need to be applied over several years to ensure that all the seed has been removed but eventually it will be eradicated provided it is not reintroduced from other areas. 3. Flame Weeding. A flame weeder can be used to burn off the plants when they are small. However if you chose to use this method there are several safety factors to consider. a. All ground vegetation must be removed. Using a flame weeder amongst leaf or pine leaf litter will set the whole woodland on fire. b. Use only when the stiltgrass is very small. Flame weeders do not work well on larger weeds they must be small. Using on a large plant again, may set the woodland on fire. c. Always ensure you have a good supply of water with you to put out any fires before they start. 4. Weed killer. While many sources will suggest the use of weed killers its not the best option. The most common weed killer is roundup (Glyphosate). This material while effective at killing weeds is very toxic, it has been proven to cause cancer in humans and it not only kills the weeds that you put it on but kills everything in the soil that it is sprayed on. This basically sterilizes the soil making it very hard for any other plants to live there. It does not make for a healthy lawn, garden and especially not a healthy woodland. While there are other weed killers available none seem to have much effect on stiltgrass. 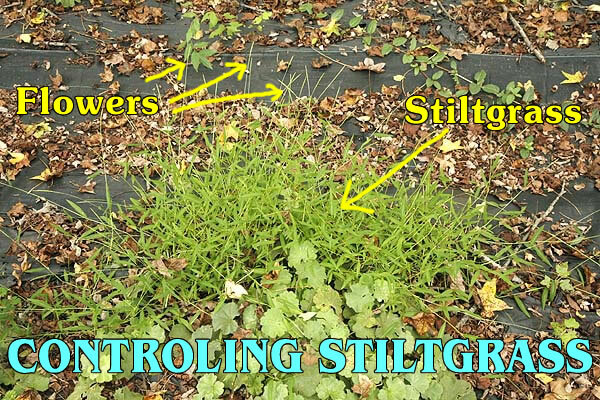 HOW TO DEAL WITH STILTGRASS IN VARIOUS LOCATIONS. In ideal locations Japanese Stiltgrass can reach four feet in height. Controlling the stiltgrass in woodlands will take quite a lot of effort but it can be achieved. If the stiltgrass has totally taken over the woodland its going to be hard to stop it. 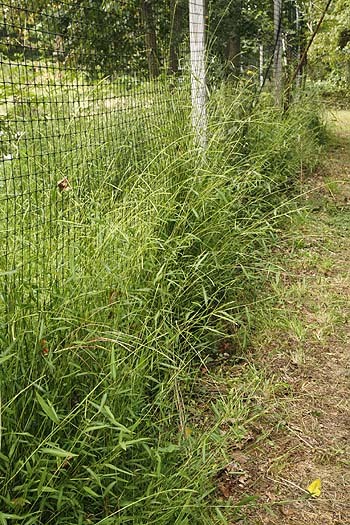 If there is just some stiltgrass then hand pulling each plant as it appears is the best option. 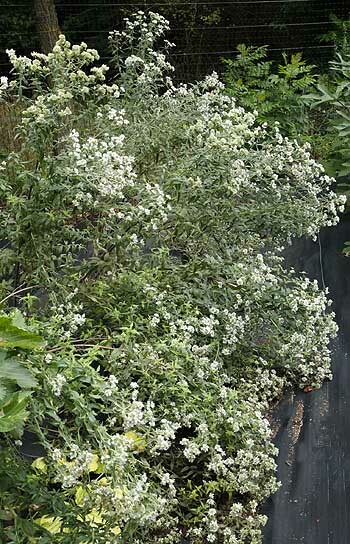 If there is a large infestation then hand pull any plants that appear outside this to prevent it from spreading. During the winter months when nothing is growing go into the woodland area and rake the ground. It is important to remove any dead branches, large twigs and leaf litter at this time so that the area can be worked in the summer months without danger of falling over obstacles that cannot be seen through the stiltgrass vegetation. Remove the stiltgrass using one or more of the above options. Remember this may have to be repeated for several years before all the stiltgrass is eradicated. In a woodland setting the important consideration is what to cover the ground with once the stiltgrass is gone. If the ground remains bare then the stiltgrass will take hold again. This can be quite difficult since a lot of native woodland plants tend to come up in the spring and then vanish once the leaf canopy unfolds and the light levels reduce. Stiltgrass does not so finding something that will grow at this time is not always easy especially if you want to keep your spring flowering natives. Often this can be achieved with the use of native grasses, ferns or other material. See if you can find a native plant nursery in your area and talk to them about what plants would be best to us. Once your new plants are installed ensure that the area is constantly checked and any small stiltgrass plants are removed to ensure that a new infestation does not occur. If you have a lawn that is in a shady spot that is getting overrun with stiltgrass then you may have to consider removing the lawn. Most grasses, except stiltgrass, dont do well in shady areas. Its almost impossible to create the dense thick covering that is required to stop stiltgrass from germinating. The best option is to replace the grass with something else. Short mown stiltgrass. It has still taken over this area and beaten out all other grasses. You can try seeding the area with some other low growing plant or adding other plants to your lawn such as clover. While this will not give you the monoculture you might desire it will help to keep the ground covered and with clover it will also fix nitrogen that will help feed the lawn grass and make it stronger and thicker. Remove the lawn entirely and replace it with a ground cover plant. Things like pacasandra work very well. It produces a dense canopy that the stiltgrass cannot penetrate and provides a low growing cover that will keep the stiltgrass at bay. If you dont like this plant they talk to your local garden center or nursery and see if they can suggest something else that will grow in your area. For areas that are on the edge of sunshine it may be possible to re-establish a good grass lawn. Provided that the shade area behind it has all the stiltgrass removed from it. Mowing down the stiltgrass will not control it just cause it to set seed as a much lower height. The plants must be removed. Use one of the methods above to remove the stiltgrass. We tend to recommend the use of a flame weeder as being the best option. These can be purchase fairly inexpensively at Harbor Freight stores. Just take care when using one and ensure that there is no combustible material that can cause the garden to catch fire. Ensure that you have a good grass seed that will grow in a semi shaded area. Work on and seed your grass in the fall NOT the spring. This will allow the grass seed to become established over the winter months are reduce the amount of bare ground that the stiltgrass has to grow on. In spring allow your grass in this are to grow slightly longer than normal to help shade the ground and to show up any stiltgrass plants that grow. Pull these out by hand. It may be tedious for the first few years as all the seeds germinate but eventually it will be eradicated. Whatever method you choose to remove stiltgrass the main thing to remember is that this invasive is here to stay. If you dont want it in your garden they you will need to be vigilant. If it is here now then it will return from wherever those first seeds came from. Now you know what to look for you can walk around and spot the plants as they come up and quickly remove them. This is going to be an ongoing battle that will never end. You can never truly win but you can keep it under control. Author Janice Hazeldine PhDPosted on September 15, 2017 September 15, 2017 Categories plant problems, plantsTags dealing with invasive grass, dealing with stiltgrass, how to deal with Japanese stiltgrass, how to deal with stiltgrass, how to remove stiltgrass, invasive plants, invasive weeds, Japanese stiltgrass, Microstegium vimineumLeave a comment on Dealing With Japanese Stiltgrass. 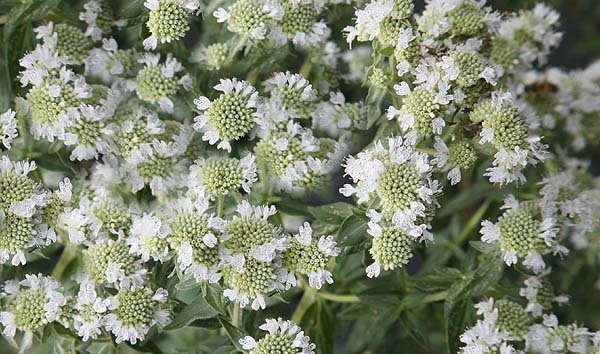 29 REASONS TO GROW MOUNTAIN MINT. It’s a perennial, comes back every year. It gives pollen and nectar at a time of the year when there is not a lot else for them to eat. Can be used instead of peppermint. Flowers are also edible and can be used to decorate salads, desserts etc. 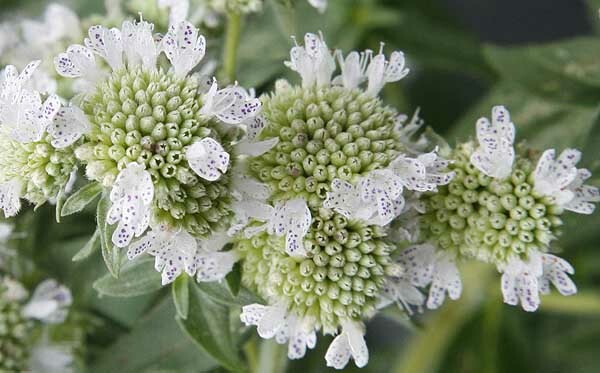 Grows taller than regular mint, around four feet. Will take semi shade, but does like full sun. Flowers first year from seed. Stays fairly compact, plants increase in size over time. Great for areas where not a lot else grows. Ideal for any garden. Plant it , leave it and enjoy the flowers. Detailed growing information and seeds. Cascade of flowering mountain mint plants (Pycnanthemum virginianum ) in our field. Author Janice Hazeldine PhDPosted on September 8, 2017 Categories Garden work, plants, polinatorsTags easy care plant, easy to grow plant, great bee plant, great perennial plants, great pollinator plants, hairy mountain mint, Mountain Mint, peppermint substitute, Pycnanthemum virginianum, reasons to grow mountain mintLeave a comment on 29 REASONS TO GROW MOUNTAIN MINT.